Can anyone remember the time when the navigation of a long haul airline flight depended upon the skill of a human ? A guy they called the navigator. A time when navigation was with pencil, map, sextant, sun and stars and not on some bland, black box run by electronics? A time when the navigator took over during a flight after leaving land ? Oh yes there were aids on land low frequency radio aids, lights, homing beacons, but remember when flying over water these aids did not help the crew they were quite useless. The Professional Flight Navigator, like the professional Radio Operator, both crew members on over water airline flights have long been forgotten in civil aviation. The Navigator on board aircraft had there origins at sea where the need for accurate position was needed by ships travelling long distances on the ocean. With the advent of the airplane, airborne navigation was designed to help the flight crew know its position over the water. The technique was the same as the maritime methods, but the speed created more of problem. During the war years aerial navigation developed into a sophisticated science. Early aerial navigation methods grew into the development of radio navigation aids, and progressed into the sophisticated satellite navigation of today. From the very beginning of airline flying, all over water flights carried a navigator. 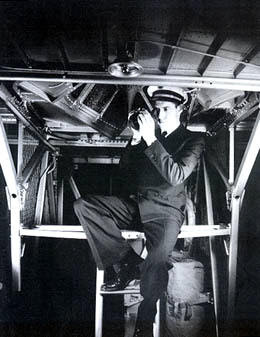 The navigator was an integral part of the flight crew . 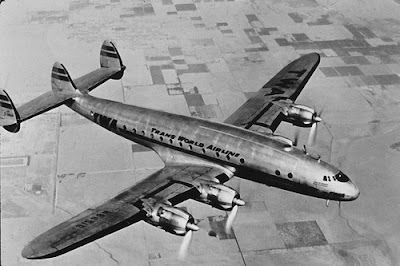 All large four engine transports used on the over water flights had a position for the navigator. Remember the picture of the old Pan Am Boeing 314 Flying Boat and the view of the flight deck with the navigator standing at his chart table as if he was on board an ocean liner? The navigator on these boats had a well lit chart table below two large windows, out of which he could make certain navigational sights. He also had telescopic drift sight and a large panel to hold all his navigation instruments. On DC-4’s, DC-6’s, DC’7s and Connies etc. the navigator had his own flight station, although not as elaborate as the old Flying boat, but just as efficient. 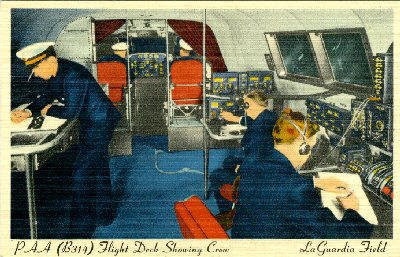 The navigator’s of that time period worked at their station on a small table affixed to the aircraft. 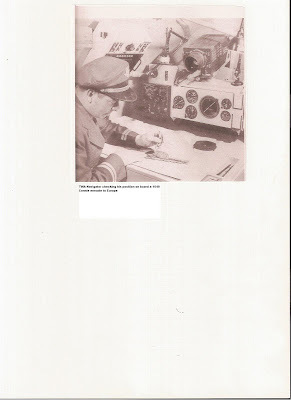 At his station he had charts, an accurate time piece, (Chronograph) a weems plotter, a slide or circular flight computer, his air almanac, HQ 249 star tables, his sextant locked in a framed box, a pair of dividers, many pencils. On later flights he would have a LORAN set to work out lines of position. What brought this subject to mind was an article I found in Flight International magazine from October 11, 1962. I t was sort of a sad story about how TWA was now relying upon A Bendix electronic Doppler navigation system to navigate their Boeing 707’s over the ocean. And the way of the Navigator was going into the books. On October 1, 1962, TWA flew its first two Atlantic Crossings without the use of a human navigator, relying instead on duplicate Bendix Doppler computers operated by the pilots. So began the demise of the human flight navigator. Just the day before these flights TWA furloughed 37 of its 55 navigators. Thus began a new era in trans Atlantic navigation. The Airline Navigators Association was strenuously contesting this new “Do it yourself Navigation”. Their argument was set upon the fact that Doppler Navigation might reduce ATC separations over the Atlantic. TWA claimed they had been testing Doppler navigation on their 707’s for over two years, proving to themselves and the FAA that they can dispense with navigators without the loss of safety or track keeping accuracy. The ANA argued that they had reports from military and civil research agencies and from its own members that the Mid Atlantic Shelf has magnetic anomalies, which interfere with compasses and radio propagation causing unchangeable navigation errors of significant magnitude. 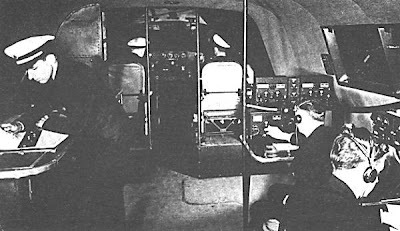 It seems the demise for the navigators came when TWA pilots stated that they spend between 15 and 20 minutes plotting fixes with the Doppler and reporting position reports during the overseas flight and that they are no more occupied with navigation than during normal airway flying over Europe or United States. The two innagural navigstorless flights made from New York to London and Paris, made landfall respectively ten miles and two miles off course after 1,750 or more miles over ocean. The London flight was four miles south of track with the Doppler according to a fix plotted by radar on the ocean station vessel Charlie. The navigators livelihood was at stake at TWA. The Doppler was thoroughly tested and the most damaging thing to the navigators was the pilots report on the ease of Doppler Navigation. So began the demise of the Flight Navigator. The final issue of the Flight Navigator’s on board aircraft of TWA was concluded with the Airline Navigators Association in 1964 agreeing to surrender their jobs at TWA in return for a up front cash payment plus three years of severance pay and health insurance. So like the Navigator's who once flew the oceans for TWA, the airline itself was ended with it's final flight on December 1, 2001 with an MD-80 Aircraft (N948TW). The ceremonial last flight was Flight 220 from Kansas City, Missouri, to St. Louis, with CEO Captain William Compton at the controls. The final flight before TWA officially became part of American Airlines was completed between St. Louis and Las Vegas, Nevada, also on December 1, 2001. At 10:00 p.m. CST on that date, employees began removing all TWA signs and placards from airports around the country, replacing them with American Airlines signs. At midnight, all TWA flights officially became listed as American Airlines flights. Some aircraft carried hybrid American/TWA livery during the transition, with American's tricolor stripe on the fuselage and TWA titles on the tail and forward fuselage. Signage still bears the TWA logo in portions of Concourse D at Lambert St. Louis International Airport. On some MD-80 aircraft, the cabinets retain TWA logos. 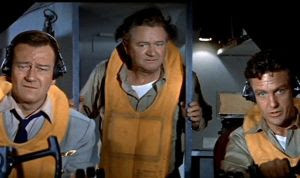 How can I let the most famous airline navigator in the movies, the hard working Lenny Wilby from the movie “The High And The Mighty not be recognized? As TOPAC Flight 420 passes the infamous Point Of No Return at 9,000 feet above the Pacific Ocean on a flight from Honolulu to San Fransico, the No. 1 engine throws a prop and the insuing fire cause the engine to break free from the mounting bolts and hangs partially off the wing causing an increase in drag. 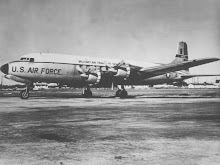 Anyway, with more than a 1,000 miles to go the engine breached the left wing's outboard fuel tank (#1) resulting in the loss of a critical 200 gallons of the less than 1,300 of fuel that remained from the original 3,050 gallon load which the DC-4 had taken on at Honolulu. That’s the scene. Now Navigator Lenny Wilby at first believes the airliner has enough fuel to make land, but then finds an error in his calculations and realizes they will run out "11 minutes short" of the airport unless the winds change. His error was he used statute miles instead of nautical miles and came up a little short. Looks like they may have to ditch the bird in the ocean. Great Movie, and Lenny did correct his error! Brilliant web site, I had not come across propspistonsandoldairliners.blogspot.com previously during my searches! This is a inquiry for the webmaster/admin here at propspistonsandoldairliners.blogspot.com. For Charlie, sure use what ever you want. Thanks for sharing the link - but unfortunately it seems to be not working? Does anybody here at propspistonsandoldairliners.blogspot.com have a mirror or another source?